AppsFlyer’s integration with GTM (Google Tag Manager) allows the developer to send in-app events to both Firebase and AppsFlyer. This means that there is no need to send the same event twice. All events that are sent using GTM are modeled after AppsFlyer in-app events. The event name, parameters and structure are all the same. If you already have GTM in your app, using it to send events to AppsFlyer is straightforward. This guide shows how to use Google Tag Manager to send a purchase event. The steps and instructions listed in this guide are relevant for any event that you wish to send. Events that are sent using GTM are sent as server-to-server events. In raw data reports for in-app events, the event source appears as s2s. This section discusses the necessary setup in Google Tag Manager UI. All the steps described in this section are required in order for Google Tag Manager to send events to AppsFlyer. Follow the steps in the order they are listed. The steps described in this section relate to a purchase event but are relevant for any event that you wish to send. 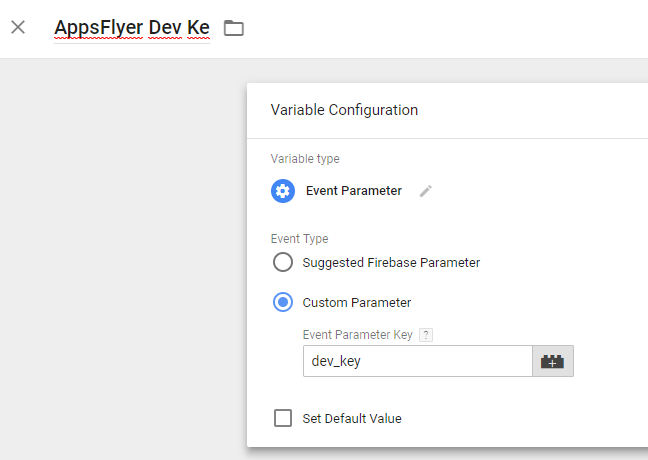 Whenever Google Tag Manager sends an event to AppsFlyer, it must send it with the AppsFlyer ID and Dev Key. 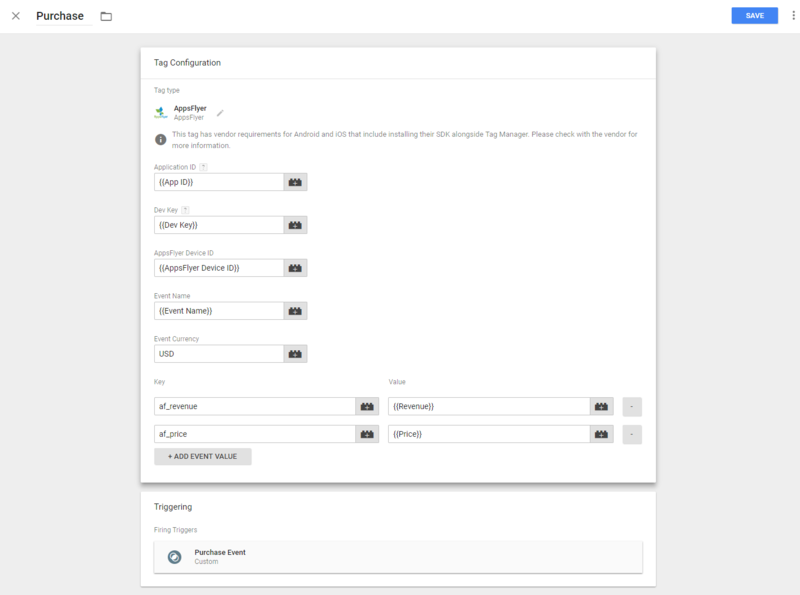 The Dev Key allows Google Tag Manager to communicate with AppsFlyer servers. The AppsFlyer ID lets AppsFlyer know what user to attribute the event to. For iOS, an additional Event Parameter should be configured. Follow the same flow as listed above. Create a variable and name it "Apple App ID". In the Event Parameter field, enter "apple_app_id" and save. The next step is to create and set AppsFlyer ID and Dev Key variables inside the app. This step is discussed in the Sending Events Section. Most in-app events require event value parameters. In this case it is the af_revenue and af_price parameters but you can send any event parameters. Now that the event is configured in the app, revenue and price variables need to be created in Google Tag Manager. These variables are used later on in the Purchase event tag. For "af_revenue", name the variable "Revenue" and set the Event Parameter Key to "af_revenue"
For "af_price", name the variable "Price" and set the Event Parameter Key to "af_price"
The example here shows how to create event parameter variables for Revenue and Price event parameters. You can create event parameter variables for any kind of event parameter, according to the event that is sent. In order for Google Tag Manager to know if the event should be sent to AppsFlyer, a trigger for the event must be configured. In the conditions, set the trigger to fire when the Event Name equals "af_purchase"
Now that the required variables and the event trigger are set, you can create the Purchase event tag. For iOS, set the "apple_app_id" custom variable in the Application ID field. Key: af_revenue, Value: choose the Event Parameter Variable "Revenue"
Key: af_price, Value: choose the Event Parameter Variable "Price"
Build and install the application on a test device and check the debug log to see that the event is triggered and sent. This section discusses how to setup and create events in the app with Google Tag Manager. When the event is sent, GTM checks to see if there is a tag that is configured to process this event with the help of the event trigger. The event trigger is set to fire the tag whenever a specific event is sent. If a specific event is sent and it has a corresponding trigger, the tag is fired. When the tag is fired, Google Tag Manager collects all the data in the event. Such data includes the AppsFlyer ID, Dev Key, event name and event parameters. After collecting all the data, Google Tag Manager sends the event to AppsFlyer. For iOS, parameters are available across the app. You can retrieve them through the AppsFlyerTracker instance. The first step is to configure the event in the app. The event is sent using Firebase Event Logging In the event you specify the AppsFlyer ID, Dev Key, event name and event parameters. The AppsFlyer ID and Dev Key are retrieved from the variables that are created in the setup step. 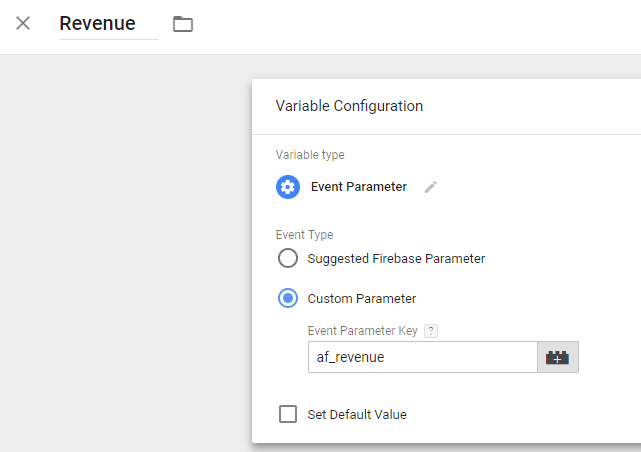 Google Tag Manager uses Firebase Analytics Events to trigger tag events. Whenever an event is sent to Firebase, Tag Manager recognizes the event and sends it to AppsFlyer as well. You can also send install events to Firebase with all install related data. To send install events to Firebase in Android, you can use the conversionDataobject. This method accepts a conversionData object. The method checks whether install time, media source and campaign are null, and if so sets the install time to the current time and the media source and campaign organic. Otherwise, it takes the data from the conversionData object and sends it to Firebase. This code checks if this is the first time the app is launched. If so, it calls the sendInstallToFirebase method. This method receives the installData object and checks if the install is organic or not. If it's organic, it sets the install time to the current time and the media source, campaign and install type to organic. If the install is non-organic, the method gets the relevant non-organic install data. Once the parameters are set, the method sends the install event to Firebase. The code snippet above checks if this is the first time the app is launched. If it is, it calls the sendInstallToFirebase method. This method accepts the installData object and checks if the install is organic or not. If it's organic, it sets the install time to the current time and the media source, campaign and install type to organic. Certain media sources don't allow their data to be shared with third-party platforms and services. If you are working with partners such as Facebook, Twitter, Snap, Pinterest etc. who have set restrictions on sharing their data with third-party platforms and services, please make sure to follow their guidelines and remove any data which is under these restrictions.